What happens when a guy who understands nearly everything there is to know about motorcycles buys a rare—and ugly—old, Italian bike and hands it over to a shop with a knack for bringing out the understated beauty in anything? This Ducati Pantah, which you see above. Before, though, it was what Revival dubbed the "Fifteen Hundred," based on its purchase point and the fact that they felt it was purely a collection of junk. 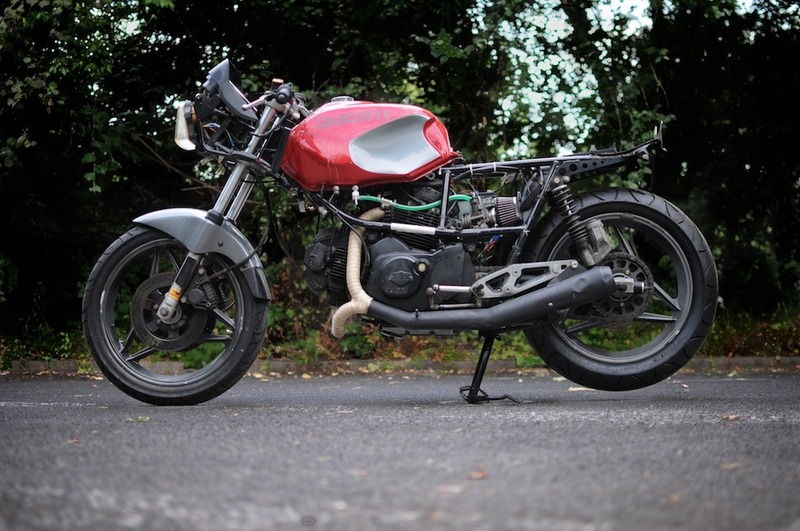 The story goes like so: one of Revival's clients was an ex-motorcycle racer, and he spent ages talking to Revival about what he wanted out of a bike. Before pulling the proverbial trigger on the bike, he presented it to Revival. It was little more than a stunningly awful pile of junk. The guys got to work, blasting away decades of dirt, grime, and paint to find a still-very-nice-looking motor under everything. After completely rebuilding the engine and transmission, they embarked upon the rest of the bike. They basically deleted the back half of the structure and built their own subframe—it's now lighter, stronger, and offers more comfy positioning for passengers. Of course, nothing adds to comfort like a great seat, so Revival called upon their usual seat-maker to work one up in black suede with offset stitching that matches the paint on the rest of the bike. The hardest part of the build? The decision to use the stock fuel tank meant a lot of work had to be done to A) make it look pretty and B) fit all of the bike's electronics in there without making it look like a mess of new wiring. The plan is to eventually give the bike more power and a proper aftermarket suspension, but for now they've got both the look and the sound down pat. Notice how perfectly the exhaust hugs the motor without touching it? It's details like that that make a good build great. Aaron Miller is the Rides editor for Supercompressor. He still can't believe the "before" photo is of the same bike.